Baking Soda: Reduce and Remove Laundry -Body odors on our clothes and linens are caused by bacteria. The bacteria are removed when detergent molecules break up the bacteria cells on the fabrics to be flushed away. However, less expensive detergents that don’t contain hard-working enzymes to tackle bacteria need a boost to work more effectively.Baking soda helps to regulate the pH level in the washer’s water by keeping it from being too acidic or alkaline. By adding 1/2 cup of baking soda to each laundry load, detergents can work more effectively and reduce bacteria.For heavy odor problems like underarm perspiration or environmental odors like cigarette smoke, use baking soda and water as a pre-soak. Dissolve 1 cup or 2 cups of baking soda in some warm water. Fill the washer tub or a large sink with cool water and add the dissolved baking soda. Add your stinky clothes and allow them to soak overnight and then wash as usual.If you have garments that need refreshing and they are NOT washable, place them in a sealable container like a storage tub with an open box of baking soda. Leave them for at least 24 hours – longer is better – to help remove odors. Baking Soda: Boost Bleach and Detergent Performance- bleach is often used to help remove odors and general grime in our laundry. In water that is too acidic or alkaline, bleach needs a boost to work more effectively. By boosting its cleaning properties, you may be able to use less bleach to achieve the same results, saving yourself money and reducing the bleach’s impact on the environment.Add 1/2 cup of baking soda along with each 1/2 cup of bleach (be sure to add the bleach at the proper time), will regulate the pH level in the water so bleach will work more effectively to reduce bacteria and loosen the soil.Even if you’re not using chlorine bleach, then that 1/2 cup of baking soda will boost the performance of your detergent. This is especially important if you have hard water or use a value-priced detergent. The dry baking soda should be added to the empty washer tub before dirty laundry is added. Do not place baking soda in a washer’s automatic dispensers. Baking Soda: Natural Fabric Softener Baking soda helps to regulate the pH level in the washer’s rinse water by keeping it from being too acidic or alkaline. Adding 1/2 cup of baking soda to each rinse cycle acts as a balance to suspend detergent or mineral deposits in the water and keep them from redepositing on clothes that can make clothing feel stiff.As a natural mineral, baking soda is less harsh on the environment than synthetic fabric softeners with perfumes that mask odors. This also makes it a good choice for those with sensitive skin and allergies. 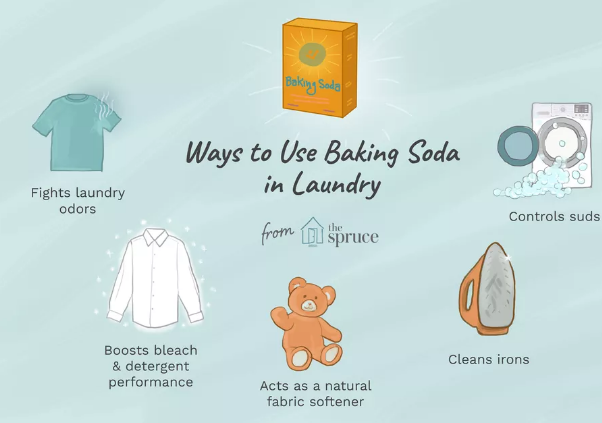 Unlike synthetic fabric softeners that can interfere with fire-retardant finishes on children’s pajamas, baking soda can be used safely.Continue to 5 of 6 below. Baking Soda: Iron Cleaner-Baking soda is a natural gentle abrasive. To remove built-up starch and scorch deposits from the face plate of a cool iron, mix a paste of baking soda and water. Using a white cloth, rub the paste over the face of the iron. For tough build-up, use the cloth to scrub gently and repeat until the build-up is gone. Finish by wiping off the faceplate with a cloth dampened with distilled white vinegar.Your iron will glide smoothly making ironing much easier and leave no tell-tale deposits. Baking Soda: Control Washer Suds -Overflowing suds from the washing machine looks funny on TV, but it isn’t much fun when it happens to you in the laundry. With the popularity of the new HE or high-efficiency front-loading washers, suds control is a priority. If you mistakenly use regular laundry detergent rather than HE detergent, you’ll see those suds begin to flow.If it happens, turn off the washer and grab your box of baking soda. Sprinkle directly on the suds to quickly break them down. The baking soda will absorb some of the moisture and clean-up will be easier.